Feeling very lucky to have missed the full wrath of Hurricane Irene. We hunkered down in Trenton, Maine and lost power and water for a few hours. The wind and rain were amazing but not disastrous here. Thunder Hole is the place in Acadia National Park to experience the thunder of the sea against the rocky shores of Maine! On calm days you may wonder what the fuss is all about (let me hear it from all who wondered what the heck?). But wait until the waves kick up a few notches. 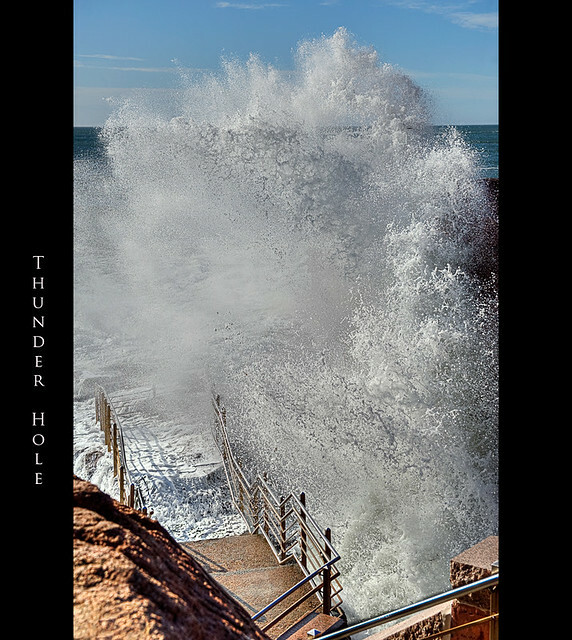 Thunder Hole is a small inlet, naturally carved out of the rocks, where the waves roll into. At the end of this inlet, down low, is a small cavern where, when the rush of the wave arrives, air and water is forced out like a clap of distant thunder. Water may spout as high as 40 feet with a thunderous roar! Hence the name: Thunder Hole. This morning the walkway was closed to the public and I didn’t want to be down there anyway. 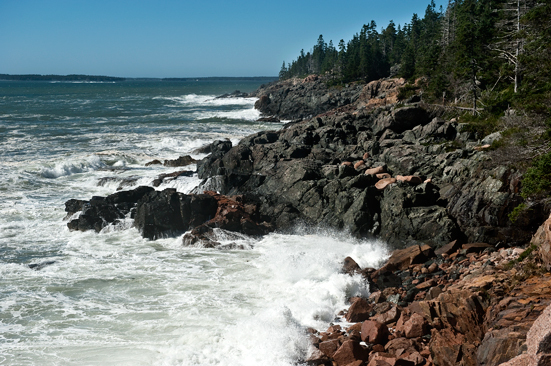 Here is another view of the waves crashing on the rocky coast line in the park.